Background Children with autism have considerable difficulties in identifying and conceptualizing thoughts and feelings, which affect their ability to manage emotions (Sofronoff, et al., 2007). Objectives By using robot-enhanced therapy (RET) we have tried to: improve the strategies they use in different social situations; modify irrational beliefs (based on Albert Ellis’ REBT/CBT model); teach them adaptive behaviors in social situations associated with anger and sadness and to reduce the intensity of negative emotions. Method 27 children with a primary diagnosis primary diagnosis of ASD, aged 6 – 12 years, were randomly assigned to either RET (12 children) or treatment as usual (TAU) group (15 children). Children in the RET group participated in six 2-h weekly group sessions. Results Children with ASD from RET group showed statistically significant more rational beliefs and they had a lower level of emotional responses intensity, after treatment compared with TAU group. We did not found any significant differences between the two groups regarding: social knowledge and adaptive behaviors. Our findings showed also important gains from pre- to post-treatment for children with ASD that participated in the RET group. Conclusion Our results may have important clinical implications for improving standard CBT for reducing emotional distress in children with ASD. Admoni, H., Bank, C., Tan, J., Toneva, M., & Scassellati, B. (2011). Robot gaze does not reflexively cue human attention. In Proceedings of the 33rd Annual Conference of the Cognitive Science Society, Boston, MA, USA, 1983-1988. Attwood, T. (2004). Cognitive behaviour therapy for children and adults with Asperger’s syndrome. Behaviour Change, 21(03), 147-161. Baron-Cohen, S., O’Riordan, M., Stone, V., Jones, R., & Plaisted, K. (1999). Recognition of faux pas by normally developing children and children with Asperger syndrome or high-functioning autism. Journal of autism and developmental disorders, 29(5), 407-418. Bauminger, N. (2002). The facilitation of social-emotional understanding and social interaction in high-functioning children with autism: Intervention outcomes. Journal of autism and developmental disorders, 32(4), 283-298. Begum, M., Yanco, H., Serna, R., & Kontak, D. (2014) Robots in clinical settings for therapy of individuals with autism: Are we there yet?. Bekele, E., Crittendon, J. A., Swanson, A., Sarkar, N., & Warren, Z. E. (2013). Pilot clinical application of an adaptive robotic system for young children with autism. Autism, 1362361313479454. Bernier, E. P., & Scassellati, B. (2010). The similarity-attraction effect in human-robot interaction. In Development and Learning (ICDL), 2010 IEEE 9th International Conference, 286-290. Chalfant, A. M., Rapee, R., & Carroll, L. (2007). Treating anxiety disorders in children with high functioning autism spectrum disorders: A controlled trial. Journal of autism and developmental disorders, 37(10), 1842-1857. Cabibihan, J. J., Javed, H., Ang Jr, M., & Aljunied, S. M. (2013). Why robots? A survey on the roles and benefits of social robots in the therapy of children with autism. International Journal of Social Robotics, 5(4), 593-618. Cao H.L, Van de Perre G., Simut R., Pop C., Peca A., Lefeber D., & Vanderborght B. (2014) Enhancing My Keepon robot: A simple and low-cost solution for robot platform in Human-Robot Interaction studies. In Robot and Human Interactive Communication, 2014. Proceedings. ROMAN 2014. The 23rd IEEE International Workshop. Coe, R. (2002). It’s the effect size, stupid: What effect size is and why it is important. Presented at British Educational Research Association Annual Conference. Exeter, England. Cohen, J. (1960). A coefficient of agreement for nominal scales. Educational and Psychological Measurement, 20, 37- 46. Dautenhahn, K., & Werry, I. (2004). Towards interactive robots in autism therapy: Background, motivation and challenges. Pragmatics & Cognition,12(1), 1-35. David, D., Matu, S. A., & David, O. A. (2014). Robot-Based Psychotherapy: Concepts Development, State of the Art, and New Directions. International Journal of Cognitive Therapy, 7(2), 192-210. David, D., Schnur, J., & Belloiu, A. (2002). Another search for the “hot” cognitions: Appraisal, irrational beliefs, attributions, and their relation to emotion. 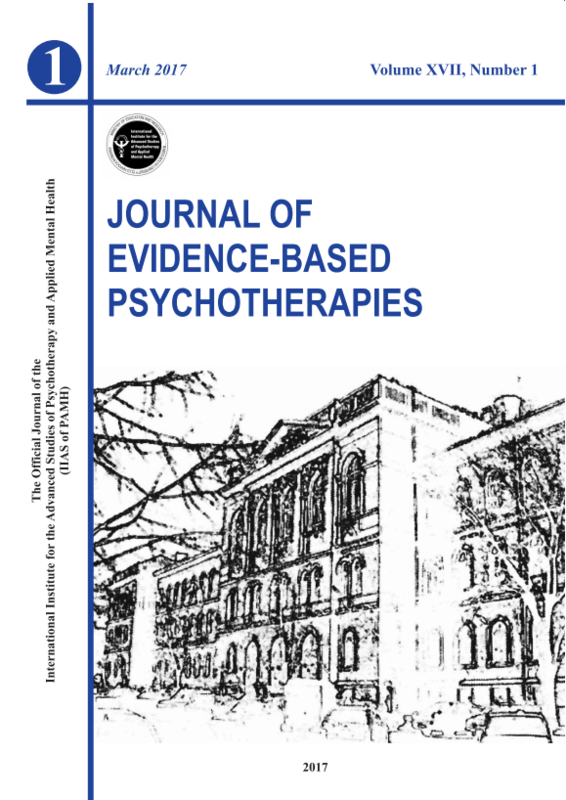 Journal of Rational-Emotive and Cognitive-Behavior Therapy, 20(2), 93-131. Diehl, J. J., Schmitt, L. M., Villano, M., & Crowell, C. R. (2012). The clinical use of robots for individuals with autism spectrum disorders: A critical review. Research in autism spectrum disorders, 6(1), 249-262. Ellis, A. (1994). Reason and emotion in psychotherapy. Secaucus, NJ: Birch Lane Press. Ellis, A., & DiGiuseppe, R. (1993). Are inappropriate or dysfunctional feelings in rational-emotive therapy qualitative or quantitative?. Cognitive Therapy and Research, 17(5), 471-477. Ellis, A., & Harper, R. A. (1975). A new guide to rational living. Prentice-Hall. Ferrari, E., Robins, B., & Dautenhahn, K. (2009, September). Therapeutic and educational objectives in robot assisted play for children with autism. In Robot and Human Interactive Communication, 2009. RO-MAN 2009. The 18th IEEE International Symposium on (pp. 108-114). IEEE. Heavey, L., Phillips, W., Baron-Cohen, S., & Rutter, M. (2000). The Awkward Moments Test: A naturalistic measure of social understanding in autism. Journal of Autism and Developmental Disorders, 30(3), 225-236. Hiah, L., Beursgens, L., Haex, R., Romero, L. P., Teh, Y. F., ten Bhomer, M., … & Barakova, E. I. (2013, August). Abstract robots with an attitude: Applying interpersonal relation models to human-robot interaction. In RO-MAN, 2013 IEEE (pp. 37-44). IEEE. Jahromi, L. B., Meek, S. E., & Ober‐Reynolds, S. (2012). Emotion regulation in the context of frustration in children with high functioning autism and their typical peers. Journal of Child Psychology and Psychiatry, 53(12), 1250-1258. Kleinman, J., Marciano, P. L., & Ault, R. L. (2001). Advanced theory of mind in high-functioning adults with autism. Journal of autism and developmental disorders, 31(1), 29-36. Kozima, H., Nakagawa, C., & Yano, H. (2003). Attention coupling as a prerequisite for social interaction. In Robot and Human Interactive Communication, 2003. Proceedings. ROMAN 2003. The 12th IEEE International Workshop, 109-114. Kozima, H., Nakagawa, C., & Yasuda, Y. (2007). Children–robot interaction: a pilot study in autism therapy. Progress in Brain Research, 164, 385-400. Laurent, A. C., & Rubin, E. (2004). Challenges in emotional regulation in Asperger syndrome and high-functioning autism. Topics in Language Disorders,24(4), 286-297. Lord, C., Risi, S., Lambrecht, L., Cook Jr, E. H., Leventhal, B. L., DiLavore, P. C., … Rutter, M. (2000). The Autism Diagnostic Observation Schedule—Generic: A standard measure of social and communication deficits associated with the spectrum of autism. Journal of Autism and Developmental Disorders, 30(3), 205–223. Mazefsky, C. A., Herrington, J., Siegel, M., Scarpa, A., Maddox, B. B., Scahill, L., & White, S. W. (2013). The role of emotion regulation in autism spectrum disorder. Journal of the American Academy of Child & Adolescent Psychiatry,52(7), 679-688. Pop, C. A., Simut, R. E., Pintea, S., Saldien, J., Rusu, A. S., Vanderfaeillie, J., … & Vanderborght, B. (2013). Social Robots vs. Computer Display: Does the Way Social Stories are Delivered Make a difference for Their Effectiveness on ASD Children?. Journal of Educational Computing Research, 49(3), 381-401. Rieffe, C., Oosterveld, P., Terwogt, M. M., Mootz, S., Van Leeuwen, E., & Stockmann, L. (2011). Emotion regulation and internalizing symptoms in children with autism spectrum disorders. Autism, 15(6), 655-670. Samson, A. C., Huber, O., & Gross, J. J. (2012). Emotion regulation in Asperger’s syndrome and high-functioning autism. Emotion, 12(4), 659. Scassellati, B., Admoni, H., & Mataric, M. (2012). Robots for use in autism research. Annual Review of Biomedical Engineering, 14, 275-294. Simonoff, E., Pickles, A., Charman, T., Chandler, S., Loucas, T., & Baird, G. (2008). Psychiatric disorders in children with autism spectrum disorders: prevalence, comorbidity, and associated factors in a population-derived sample.Journal of the American Academy of Child & Adolescent Psychiatry, 47(8), 921-929. Sofronoff, K., Attwood, T., & Hinton, S. (2005). A randomised controlled trial of a CBT intervention for anxiety in children with Asperger syndrome. Journal of child psychology and psychiatry, 46(11), 1152-1160. Stewart, M. E., Barnard, L., Pearson, J., Hasan, R., & O’Brien, G. (2006). Presentation of depression in autism and Asperger syndrome A review. Autism,10(1), 103-116. Thill, S., Pop, C. A., Belpaeme, T., Ziemke, T., & Vanderborght, B. (2012). Robot-assisted therapy for autism spectrum disorders with (partially) autonomous control: challenges and outlook. Paladyn, 3(4), 209-217. Vanderborght, B., Simut, R., Saldien, J., Pop, C., Rusu, A. S., Pintea, S., … & David, D. O. (2012). Using the social robot probo as a social story telling agent for children with ASD. Interaction Studies, 13(3), 348-372. Wood, J. J., & Schwartzman, B. C. (2013). Cognitive behaviour therapies for youth with autism spectrum disorders. Cognitive behaviour therapy for children and families, 189-202.